Open Microsoft Edge from the desktop, enter the URL of a website that you want to add to your Favorites list, and then press Enter. Click the Add to Favorites or Reading List button on the address bar. In the pane that opens, click Favorites at the top. Modify the name of the Favorite listing to something easily recognizable, as shown in the following figure. Click the Hub button (a set of three jagged horizontal lines) on the address bar. In the Hub pane that appears (see the following figure), click the Favorites (star) button. If you saved the favorite in a folder, click the folder in the list. (Click Favorites above the folder contents if you click the wrong folder.) When you see the favorite to open, click it. The Hub pane closes, and the favorite appears in the current tab. Additionally, the Add to Favorites or Reading List button changes to show a filled yellow star. Regularly cleaning out your favorites or reading list is a good idea — after all, do you really need the sites that you used to plan last year’s vacation? With the Hub displayed, right-click any item and then choose Remove to delete it. In some cases, the shortcut menu has a Rename command, too. Click it to rename the item. If you created new folders when adding other favorites, you can manually transfer other favorites into those folders. 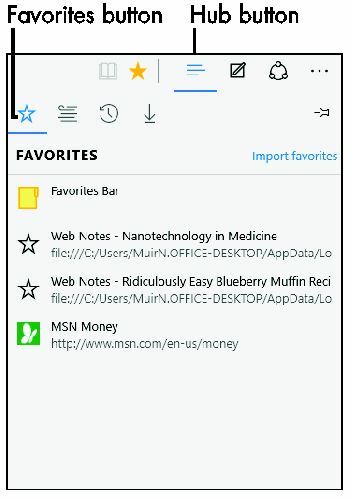 To do this, just display the Hub and click and drag a favorite listed there onto a folder. 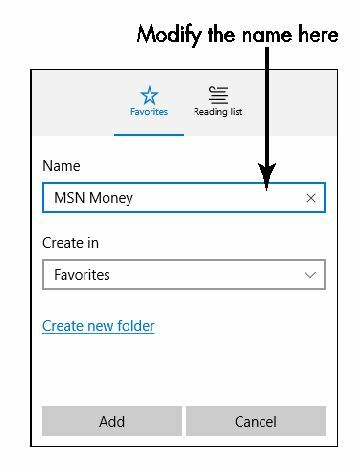 To move a favorite from within a folder back to the main favorites list, open the folder in the Hub, and then drag the favorite onto the word Favorites above the folder content.